DO NOT READ THAT BLURB ABOVE. IMO, it ultimately gives away spoilers and the whole premise of the book. I like to go into the books I am reading blind (and then read the blurbs afterwards) so if you are anything like me, take my advice. Every time Erin Watt puts out a new book it’s like an instant jolt of excitement coursing through me. Although the conclusion of the Royal series was not my favorite, I was ready to see what they came up with next. And I am here to say that I was highly impressed with One Small Thing. Guys, this story line has been done before, but I don’t feel like that should matter. It’s much different in other aspects. Erin Watt slayed. I didn’t realize they could write such a compelling YA novel but I am SO here for it. These two girls have a way of writing that captivates me, story line wise. I get so lost in their story that I feel like I am actually there with these characters. I was with Beth and her parents, at the parties, at school, in Beth’s backyard. I was there for the whole book I couldn’t even put it down. I was too afraid I would miss something, I HAD to keep going. That kind of writing, the kind that gets you hooked from the get go and doesn’t let you go until you are done and you have goosebumps on your skin from reading the last sentence, yeah. THAT is my favorite kind of writing. The best part of the entire book is the character growth of both Chase and Beth. Yes, BOTH. They both dug through their lives and worked out what needed to be worked out and worked on themselves before they focused on each other. Not only that but they were both exciting and interesting characters to read about. The only thing that could have made this book even an ounce better, was multiple POV’s. One for Beth and one for Chase. Regardless- I was satisfied with the way their story played out. And y’all know I am all about that high school angst and drama. 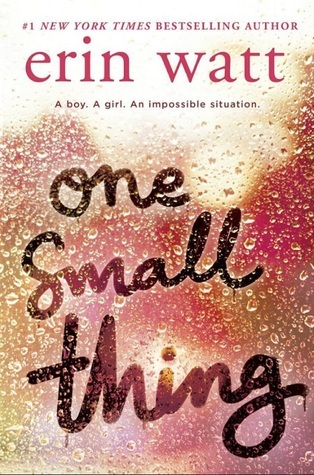 One Small Thing is a great story about forgiveness, loss, and finding that hope you’re searching for when it’s so dark in your life you don’t ever think you will find it. This book isn’t just another YA book, this book shows how people can put differences aside, stop being selfish, and accept others for who they truly are, regardless of their past. At the end of the book, the way the title fits into the story lit up my face with the biggest smile. Because it’s true- at the end of the day, we just need that one small thing.